The Library's proxy supports all major web browsers (including Chrome, Edge, Firefox, Internet Explorer, and Safari). 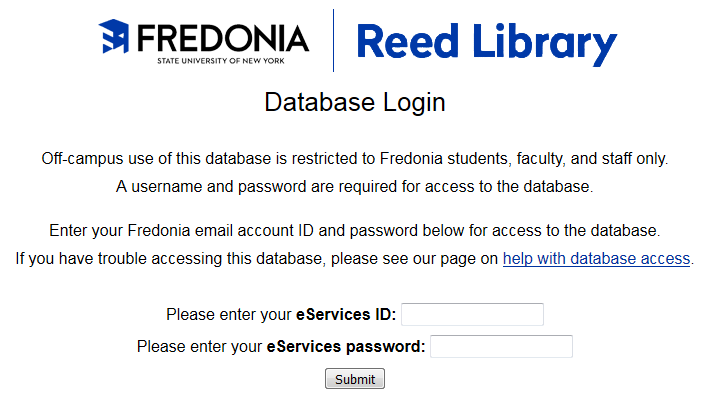 Access to most databases and most journals is restricted to members of the State University of New York at Fredonia community. If you are not a current Fredonia student, faculty, or staff member, you will not be able to access these resources. If you can access this screen, but keep getting a message saying that your password is incorrect, first verify that you are entering your credentials properly. If that does not work, please contact the ITS Service Center to have your password reset. If you do not see a login screen for any database, or get a "404 error," "This page cannot be displayed," "page not found," "address not found," or a blank page, this is most likely caused by a firewall. If you are only getting these errors for only one particular database, but others are working, please contact us directly at reedref@fredonia.edu or 716-673-3222. If you are trying to connect to the internet through your workplace, or a school, it could be that the administrators have blocked certain ports for security reasons. Please refer your system administrator to this support page for assistance in remedying this issue. Some databases use pop-ups, which may be blocked by your browser. If you get a message that states that a pop-up has been blocked while using a database, add an exception for the given database or site. Typically there is a button on the top of the page, near where it tells you that it has been blocked, that will enable you to add an exception. If you are unable to resolve the problem after following these steps, contact the Library at 716-673-3222 or reedref@fredonia.edu, and we will be happy to assist you. The proxy server is a system that the University uses to make sure that students, faculty, and staff are able to access restricted copyrighted resources. We have purchased limited licenses to these databases which allow only members of the University to access them. The proxy server serves as a gatekeeper to these databases and journals so that students, faculty, and staff can access them from off campus. Fredonia students, faculty and staff use their eServices username and password to log in via our proxy server from off campus. When you click on a link to any library database or online journal from off campus, you will be prompted to enter your eServices username and password. This is the same one used to log in to the campus network, FREDapps, FREDmail, etc. Student eServices username generally consist of 2-4 letters of your last name followed by 4 numbers. Faculty and staff usernames generally consist of 2-8 letters of your last name, and possibly your first and/or middle initials. To find your eServices username and password, log in to Your Connection, then click on the "Personal Information" link and then the "View Your User IDs and Passwords" link. Locate your eServices username and initial password in the table that is displayed.